The blogger unfollowed you. Maybe they lost interest or they were just phishing for followers. The blogger never returned your follow or comments on his or her blog. 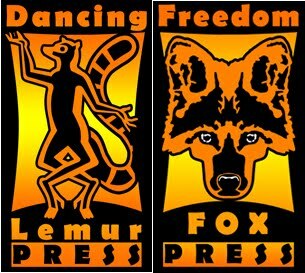 The blog shuts down or goes inactive for a very long time. 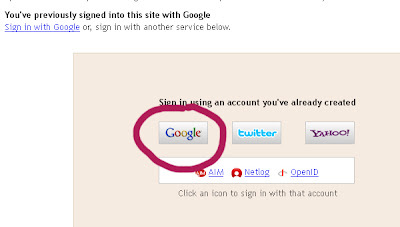 However, if you originally followed through Google Friends Connect, unsubscribing in Google Reader won’t hack it. Like a stray cat, the blog’s feed just keeps coming back. And you are still listed as one of that blog’s followers. There are two options here. 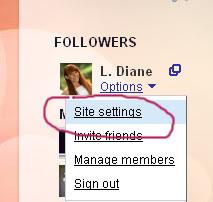 Click on the little symbol, and it will bring up a list of the blogs you follow. You can unfollow them from here. 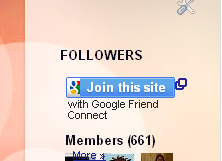 If the blogger has removed the Google Friends Connect widget (which is what some do when they take over an abandoned blog - evil!) unsubscribing here is your only option. After that, you can unsubscribe in your Google Reader and the blog will forever vanish. 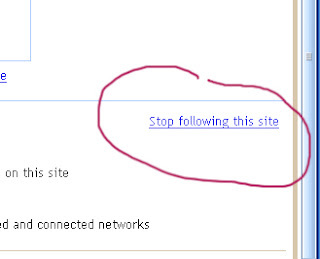 Now you have officially unfollowed and only have to remove them from your Google Reader if you use that feature. You are free at last from this blog. And in the case of annoying ads or negative green trolls, you are happy to be free! Good tips, Diane! I've had to unfollow some blogs' RSS feeds because my Google Reader kept bombing. Wasn't sure how to do it on Friend Connect, though...nice info. If it's a blogger I know, I usually write them first to make sure their blog just hasn't been hacked. I've seen that happen at least three times this year. It's a mess to get your blog back. I might unfollow them on Google Reader, but I rarely take the trouble to unfollow them on GFC. Elizabeth, with GFC, if you don't do it at the source or dashboard, they just keep coming back. 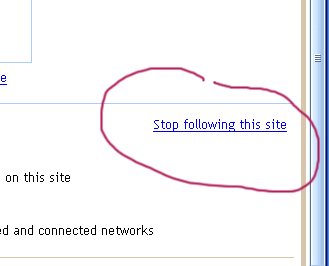 Maria, unfollowing them through GFC is the only way to keep them from reappearing in Google Reader. Sad when a friend's blog is jacked like that. It does happen. Thanks for this Diane. I never understood why I lose followers, so this is a ticklish issue for me. I can't remember ever unfollowing anyone. It's a different story if I'm following the blog via email. Then I'll unfollow them if I'm not longer interested in the blog. 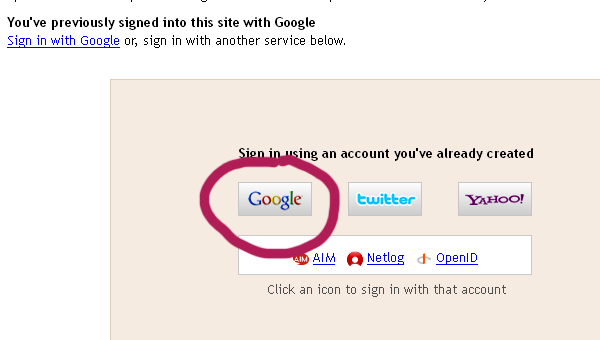 Ref: ...unfollowing them through GFC is the only way to keep them from reappearing in Google Reader. I don't think I've ever had a blog show up once I've deleted it off Google Reader. GFC is a separate and distinct feed from Reader. I've never seen the two mix--at least on mine. I've never been fond of GFC. It ignores a whole section of bloggers who don't use Blogger. Karen, I've unfollowed a couple unpleasant people and recently went through my book blogger list and was stunned how many had quit, some over a year ago. No need to keep following. Stina, I've tried to limit the ones I follow via email as I already get 300 emails a day. Maria, the ones I've deleted just keep coming back, so that was the only way I found to get rid of them permanently. Thanks for the lesson. I still have to unfollow that one guy. 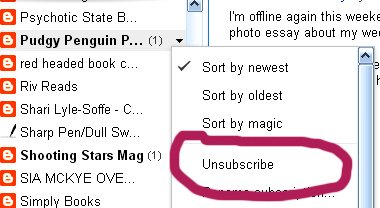 I learned the hard way that unsubscribing in Google Reader isn't enough! I really need to do this. It's on my list. Susan, I know there were a lot who'd quit last year, but I followed so many I didn't even know it. Karen, you can only add up to 300 in your dashboard, but clicking on GFC or adding to Google Reader allows you to follow a lot more. Thanks. Mostly I tend to skip over some of the blogs that don't interest me, but there have been times when someone posts 44 times in a row when I've been tempted to unfollow. Useful info. Blogging is getting so complicated lately. They are always changing how they do things.There are so many ways to follow and I don't understand half of them. I'm used to the simple 'followers' widget and follow by email and most of the others confuse me. I think I need to go to a blog school. I've never had the desire to unfollow anyone, but this is useful information in case the situation ever comes up. I do this every once in a while. Problem is, unlike Twitter, you can't easily find out who's unfollowed you. You have to have a master list to check back against. And when you have hundreds of followers, that's a real chore. Still, nothing quite as aggravating as noticing your GFC follower number has dropped and not knowing who unfriended you! Grr! Thanks for the tips. I'm more cautious now about which blogs I follow and which blogfests I'll join. Great tips! I know how to unfollow from the Blogger dashboard and it's spankin' easy. 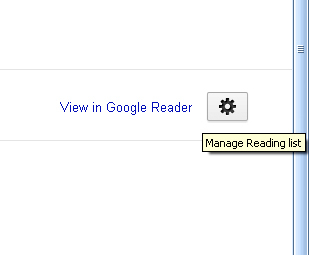 One of these days I should clean out my google reader. Johanna, now you know how to do that. Nancy, wish there was a site that would tell you. M Pax, when I cleaned out mine, I was surprised how many had stopped blogging a long time ago and I never noticed. 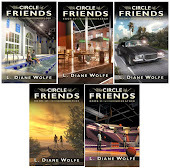 Google friend connect really makes you jump through hoops! Hi Diane .. thanks for this very useful info - some I knew, but definitely useful to have the rest. I've had a couple of Follows - that looked distinctly odd - so deleted them. The definites - were of some East European origin and I definitely didn't want others to click their picture .. Thanks for sharing the information, Diane. Good information D. I did unfollow a few blogs when I first started blogging. Your directions make it easy if I need to do it again. Thanks! Wow, who knew it was so complex! The only reason I've unfollowed a blog is if they were offensive, and that was ages ago. Thanks for the tutorial! Those are ridiculously difficult steps to unfollow! I use bloglovin' now and it is really easy. Just today I had a blog I followed (and had been inactive for a while) get take over by a major spammer. In two day there must have been like 40 posts! Thank you for the tip - I had one blogger who changed from blogspot to wordpress and I couldn't figure out how to remove that feed. Good info, although now that the info is "out there", I sure hope my number of followers doesn't plummet. My hide isn't tough enough. Hilary, there are some odd ones out there. Holly, I've had those - very annoying. Tami, it can be difficult. Carol, I can tell what to do if your blog vanishes! I've had that happen, too. I'm glad someone has worked out how to do this! Thanks. I’ve found that Just Unfollow is the most simple. It simply shows you a list of people you follow who don’t follow you, sorted by when you started following them.